Last night, Assemble, a ‘direct action’ architectural collective won the Turner prize for their work in urban regeneration in Toxteth Liverpool. They are the first ‘non-artists’ to win the prize. The Turner judges were impressed with their long term collaboration with residents in the Granby Four Streets and the fact that Assemble show ‘the importance of artistic practice being able to drive and shape urgent issues’ (The Guardian). Assemble have also been working in Glasgow for the past three years in Dalmarnock where they have established Baltic Street Playground in association with local residents and play workers Robert and Alan. Baltic Street is influenced by the post-war pioneers of ‘junk playgrounds’ and many of the ideas associated with these playgrounds are present at Baltic Street (see ‘Research‘ section on the Baltic Street website). 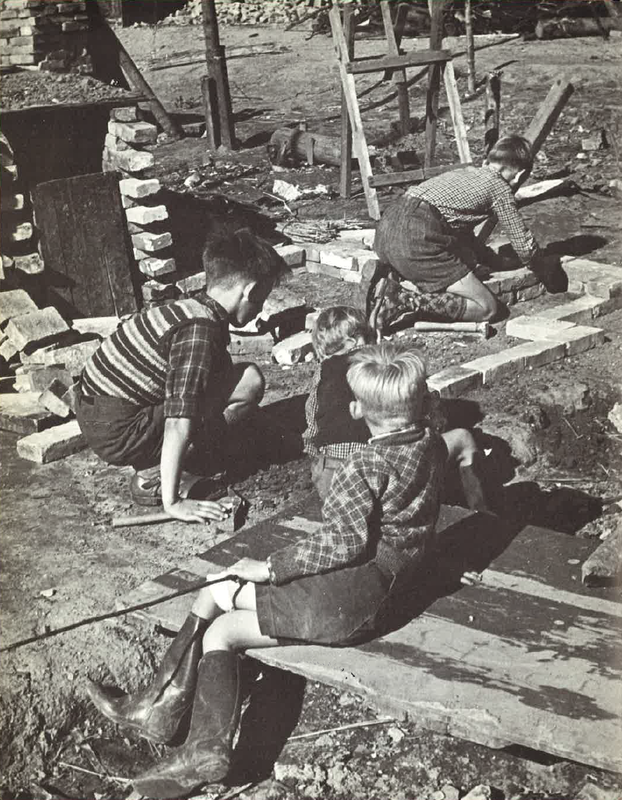 In 1943 the architect Dan Fink opened the first junk playground in Emdrup, Copenhagen along these lines and it’s leader John Bertelsen ‘created something that all flocked to see’ according to S∅renson. One of the many visitors was Lady Marjorie Allen of Hurtwood, who went on to pioneer the idea of ‘adventure playgrounds’ (note she dropped the ‘junk’) in postwar Britain. 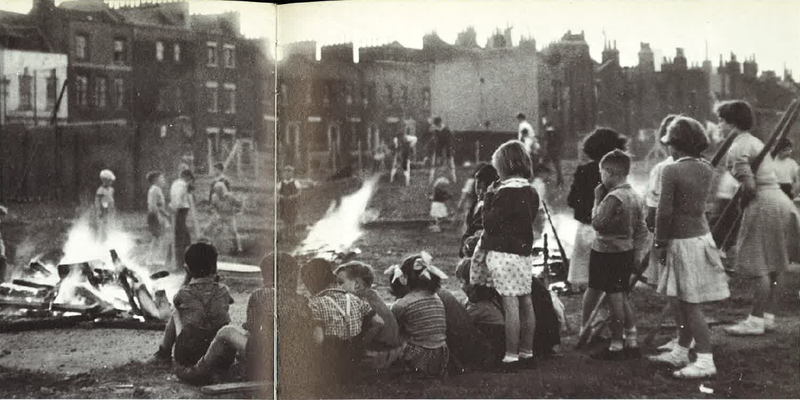 The first were in London, mostly on bomb sites, but soon there were playgrounds throughout the country. In such sites, where the destruction of the war was all too obvious, it was suggested that adventure playgrounds could provide a cathartic experience for the children who played in them. Many children would have witnessed bombings and other stresses and tensions of wartime life. 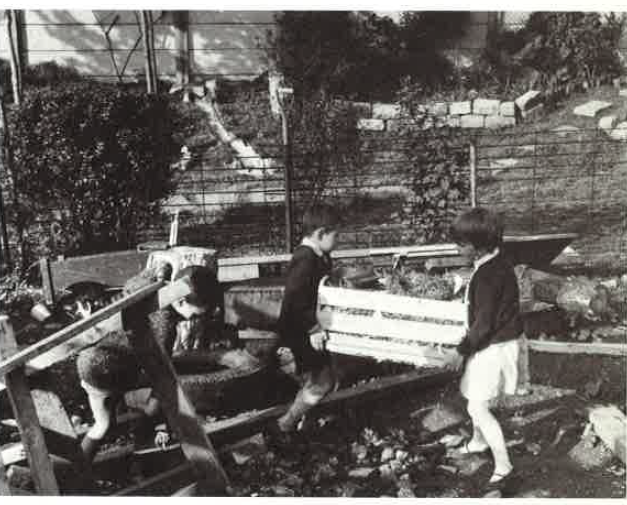 By playing in the adventure playground, where they could build and create new structures from waste materials, they were effectively rebuilding their lives just as the government was rebuilding society. Or maybe they were just playing? The secret of a successful playground is in its continual development, it is never complete, never developed. It is a sort of ‘terrain vague’ that can be many things to many children. Source: ‘The end of a perfect day’, Allen, Planning for Play, p. 59. For Marjorie Allen, the adventure playground was also a response to the limitations placed on children by the newly constructed housing estates that they found themselves living in. She suggested that there was no freedom, no where for children to belong, no where that was theirs. She particularly disliked high flats and described Red Road in Glasgow as ‘a sort of psychological pollution’ and questioned where children were to play in such housing. She quoted studies which argued that living in flats leads children to become socially isolated. The following photographs from her book contrast with the images above of children at play in adventure playgrounds. Source ‘A Lift is their only playground’, Allen, Planning for Play, p. 15. 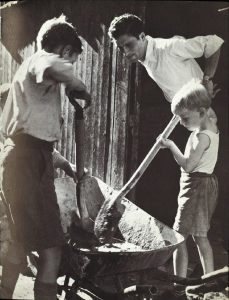 Allen was in favour of children being able to dig in the dirt, build with their hands and generally be free to make a mess and be a bit destructive in a safe environment. Imaginative play was also important. By the 1960s Glasgow also had adventure playgrounds, as discussed in a previous post, the folk singer Matt McGinn was the leader at the Venny in the Gorbals. We can guess that the Venny was established in the Gorbals to give kids growing up in the inner city, in an area with modernist high rise flats and a lot of concrete, a place to play that wasn’t just a slide, swings and a roundabout; a place where there were no ‘no ball games’ signs and they were allowed to play where they wanted without being chased by the caretaker. I’ve been told that it was the more adventurous kids that hung out at the Venny and people have great memories as can be seen on the ‘Gorbals Venny‘ facebook group. Dalmarnock, like the Gorbals in the 1960s, is an area which is undergoing regeneration. The redevelopment of parts of the area as a result of the 2014 Commonwealth Games has not been without controversy. Baltic Street is a ‘response to the lack of play space and out of school provision for community of children and families’ (see ‘our story‘ on the Baltic Street website). Perhaps, like the Granby Street renovations in Toxteth, Assemble are attempting to ‘drive and shape urgent issues’, in this case for kids growing up in an area with few amenities for them, to have a place that is theirs, where they can be free to build, create and be part of something special. For more information see the ‘Mission Statement‘ on the Baltic Street website (there’s also lots of great photos). I wonder how many people who used to play in the Gorbals Venny would like to take a wee trip to Dalmarnock and down memory lane? Did you play in the Venny in the Gorbals in 1960s and 1970s? Was there an adventure playground where you grew up? It is very important that this play history is preserved so that children’s right to play is recognised as part of the continuous history of child development. Good work to all those who post their memories for others to share.